I love chocolate and I love pecans, and cookies aren’t so bad either. 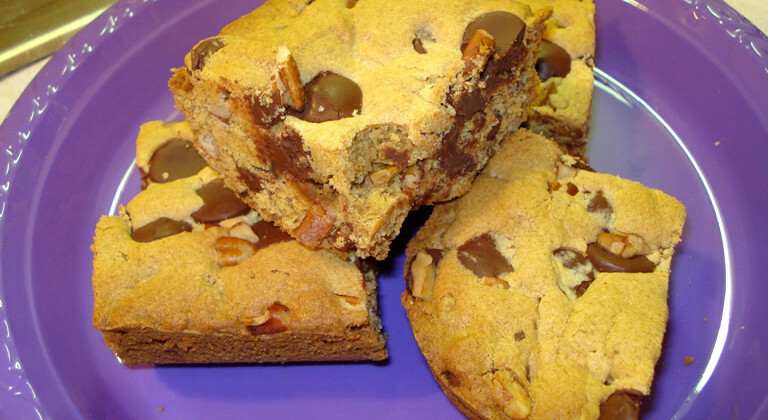 These cookie bars are simply delicious. My sister had a friend whose mother made the most delicious chocolate chip cookies, she used a package of pudding in the batter to give the cookies a soft, moist texture. I took that idea and applied it to my bars. The result was a cookie bar that was soft and moist and gone in an instant. These cookies can be easily adapted. I think they would be delicious with white chocolate chips and macadamia nuts. In mixer beat on medium speed butter, sugars, pudding and vanilla until blended. Add flour and soda in small batches until all incorporated. Stir in chocolate chips and pecans by hand. Press into a well greased 9 x 13 pan. Bake for 25 minutes or until a knife inserted in the middle comes out clean. Cool completely. Cut into 24 bars and ENJOY!